Challenge runs from January 1, 2012 to December 31st, 2012. You can join anytime. Books from other challenges count as long as they are about time travel. Books can be children's, middle-grade, YA or adult fiction. Write a post and link it below including the URL to that sign-up post. Surprise Trip: 1 to 3 time travel books. Great Adventure: 4 to 6 time travel books. Mind-boggling Voyage: 10 to 12 time travel books. Linking your reviews is optional but I encourage it so that we can discover what time travel books you've read and I can add them to the growing list that Alyce started. Here is the Link Review Page. Not sure what to read? Here is the list to give you ideas. Please note that Library of Clean Reads is not endorsing any of these books as we have not read all of them and cannot vouch that the content is clean. For those we have read, we will include a link to our review. If you know of other time travel books not mentioned here, please leave me the title in the comment section. My friend Jeromey reads time travel books almost exclusively. I have sent him a link to check out this list. I have only read a few. The first one I read was Timeline by Michael Crichton and I remember it being really action packed. Have fun with your challenge! Some other titles you could possibly consider are Asimov’s ‘The End of Eternity’, The Green Futures of Tycho (William Sleator), Thief! (Malorie Blackman), Time Raiders (Alex Scarrow), Found: The Missing (Margaret Haddix) and Charlie Travers, Time Traveller (Gill Baconnier). Some of these are children’s books. I haven’t read them all yet - they are on my own personal list to read! I would like to add my own novel, but haven’t finished writing it yet! Not sure whether The Time Traveller’s Wife can be considered a clean read. There is one section in particular which, in my opinion, was gratuitously and unnecessarily obscene. Thanks for all the book suggestions! You're right about the Time Traveller's Wife. I stopped reading it partway precisely for that reason. The key issue for me is whether something is crucial and relevant to the plot. The particular scene in TTTW could have been deleted and it would have made no difference whatsoever. In fact, about 150 pages of the book could have been safely edited out! It was very frustrating as there was a clever story buried deep within the superfluous waffle! Note for budding authors: Please don’t tell us what the ending is going to be five chapters before the end! Although I am not averse to using strong language personally, I am not comfortable reading it in a novel unless it really is necessary. If a character is shot, you would not expect him to say “Oh dear, that’s a pity” but unwarranted use of expletives is, in my view, a distraction. My sentiments exactly! For example, when I read Still Alice by Lisa Genova, there were a few f-words in the text. Now I work with those that have Alzheimers and I know that the disease causes inhibitions to be lowered and even persons who have never sworn in their life may start doing it. Therefore in this context, the language made sense as it demonstrated how the disease progressed. Thanks for adding my books to your potential list. Off to Tweet about the Challenge! Hey just wanted to give a suggestion I didn't see you linked up on a novel challenge and think it would be great for you if you went and linked up on there. A lot of people find reading challenges over there. Good luck! Thanks for the suggestion! And for helping me promote my challenges. I love time travel books. I just finished "The Map of Time" by Felix J. Palma and "Dreams Unleashed" by Linda Hawley. Both of those books have a different take on time travel. I just read one that you might want to include in your list- The Christmas Village by Melissa Ann Goodwin. It was wonderful. Also, an older one by Philippa Pearce - Tom's Midnight Garden. And there's Maggie Again by John D. Husband. I enjoyed all three. Thanks for the suggestions, Nan! I love time travel so was happy to find this challenge! This is the first challenge I've signed up for on my first official blog day. 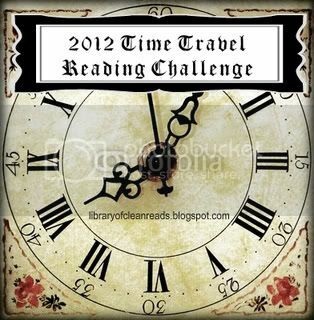 Time travel is not a genre of books that I'm naturally drawn to or would have listed as a favorite reading topic. After thinking about it I realized that many books I've loved have fallen in this category. Books by E. Nesbit and Madeleine L'Engle come to mind. I'm ready to expand my horizons. This will be a fun challenge for me. I love time travel reading. I am being conservative at 1-3 reads but hopefully I'll pass that right up! I'm starting with the 1-3 books, but hopefully I'll get to a higher level! Nice challenge! I love reading books about time travel. I'm starting with 4-6 books, but hope to read more. One of my favorite genres! One of my favorites is Pastwatch: The Redemption of Christopher Columbus, by Orson Scott Card. HOURGLASS and RUBY RED were two fun reads. Check them out! Also, not to over-plug my own books, but if you're remotely interested and have a Kindle, all 3 are on sale on Amazon until mid-January: WATERFALL ($.99), CASCADE (2.99) and TORRENT (2.99). No worries if you're not! Just thought I'd share the deal before it was over. Thanks for the heads up on your books sales. I will add the other two books you mentioned as I'm sure if you recommend them they are clean reads! I'm signing up for the surprise trip level, but hope to read more than that. What a fun challenge! Hi, I'm excited to be here. I love time travels especially Outlander by Diana Gabaldon. I'm looking forward to reading reviews and hearing about what everyone else is reading. I want to do the Mindboggling Adventure. Keep your fingers crossed. Absolutely love time travel books. I'm totally doing this. Thanks for hosting! I love that gorgeous button!